Contemporary design meets modern day luxury. Features a beautiful espresso color with high gloss finish over a rich maple wood veneer. Outlined with black edged details. A removable high gloss tray easily accommodates rings, earrings and pendants. Additional use as a storage box adding a modern touch to your decor. Lock and key with black suede tassel attached. Full mirror with cream faux suede lined interior. Removable tray, Lock and key with suede tassel. Full mirror. Measures: 10.5 x 7.5 x 4.75. 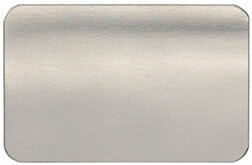 Optional brushed silver personalized engraving plate (sent separate) attaches to the top center of jewelry box cover. Weight 8 lbs. Click the button below to add the Latte II Locking Jewelry Box to your wish list.